502550 was successfully added to your cart! 502550 could not be added as a favorite. Please make sure you are logged in. High performance Ace hydraulically driven centrifugal sprayer pump with 20 gpm operating flow at 100 psi. Mount anywhere that hydraulic hoses can reach; for open center systems; connections are 1/2" pipe thread. Allows the PTO shaft to be put to other uses. 1-1/2" suction port and 1-1/4" discharge port. Viton seal. 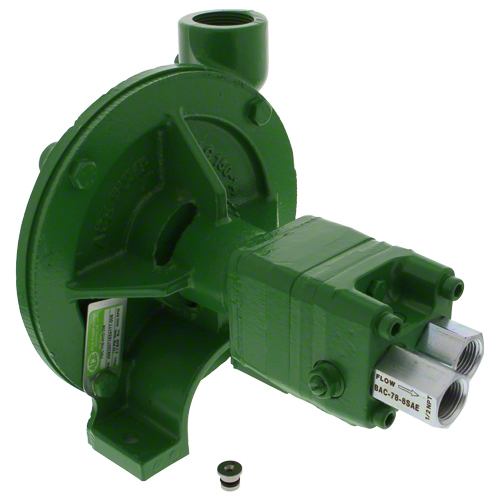 Produces 0-100 psi at 4600 rpm maximum and 60 gpm at open discharge.